For service in Southeast Asia and contiguous waters or air space there over from 4 Jul 1965 to 28 Mar 1973. 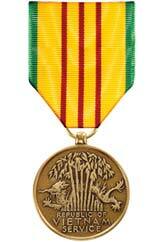 The award of the Vietnam Service Medal extends to members of all services who served in Vietnam (including its contiguous waters and airspace), Thailand, Laos, Cambodia, or airspace in direct support of military operations in the Republic of Vietnam. 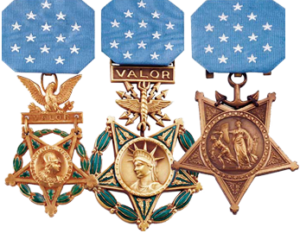 Authorized in 1965, U.S. service personnel who received the Armed Forces Expeditionary Medal for service in the region from July 1958 to July 1963 were allowed to exchange the Expeditionary Medal for the Vietnam Service Medal.